This salad is inspired by Laura at Whole Foods in Charlestown. Laura is the friendly blond woman who doles out those yummy samples throughout the week, so obviously she’s my bff (and I can’t leave out the fishmonger, Chris, who is my other bff). The other day, Laura was sampling this avocado and grapefruit salad she created, and I couldn’t get it out of my head. It’s savory, juicy, and filling, while being decadent and healthy. The acidity of the grapefruit juice cuts the richness of the olive oil and avocado. The trick is to cut the grapefruit peel off and save those peels to squeeze out the excess juice over the salad. I ate it on its own for lunch, but could also be nice on an oiled, grilled baguette. Or maybe with some grilled shrimp if you want more protein. 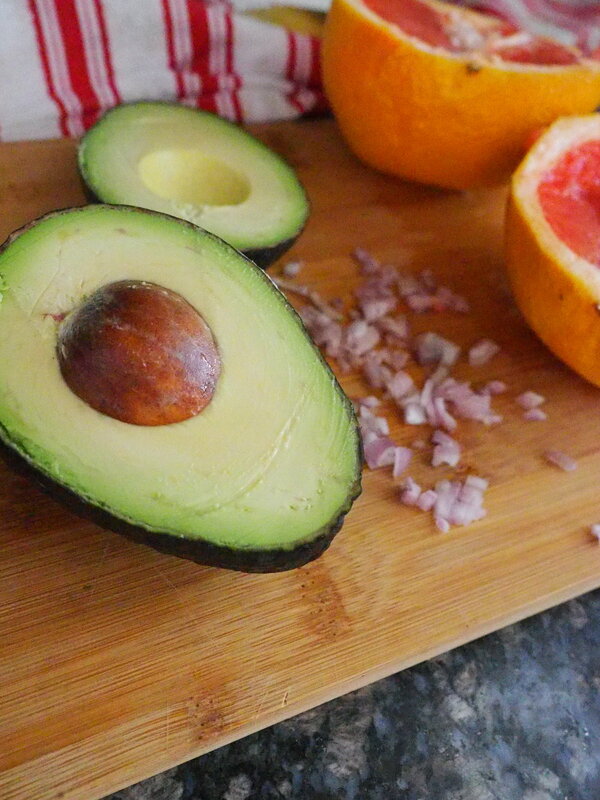 Place avocado, grapefruit segments, and shallot in bowl. Pour residual juices and squeeze any juice from the peel over the fruit. Drizzle with olive oil and apple cider vinegar. Season with salt to taste, and enjoy.